This is a recipe for a berry-flavored vinegar that would taste great as part of a vinegar and oil dressing. You can make other infused vinegars with garlic, basil, or other herbs. 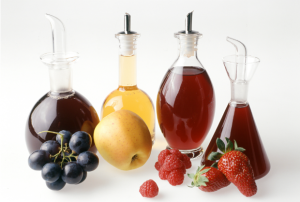 The recipe explains how to make a fruit and oil infusion. You can also replace the berries with garlic or fresh herbs. Click the How to Make Your Own Healthy Flavored Vinegars link below to read the complete article.